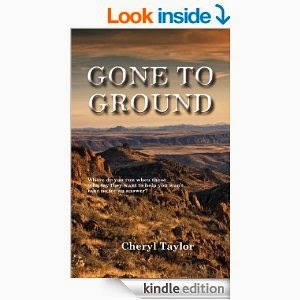 Gone to Ground by Cheryl Taylor. Following a deadly outbreak of influenza which decimates the population of the planet, the government issues orders that all remaining citizens are to report to designated Authorized Population Zones so that resources may be fairly distributed. Journalist Maggie Langton, determined not to let her son, Mark, grow up in the dangerous environment of the APZ, decides to run for the empty ranch land of northwestern Arizona. When she runs into O’Reilly, a fugitive ex-Enforcer, she grudgingly admits she needs help developing those skills needed to live on a small ranch camp. What she doesn’t expect, however, is that with knowledge of how to live rough, O’Reilly also possesses a darker knowledge: knowledge much more dangerous, and knowledge which the government will do anything to suppress. Maggie and O’Reilly find themselves in a fight to keep their newly formed family safe and out from under the rule of the controlling new government. At the same time they discover a conspiracy much deeper than anyone had believed possible. This is a post-apocalyptic type story set in a desolate America after a deadly outbreak of influenza has decimated the population. The story follows Maggie, a recent widow and a mother to a 11yr old son. She tries to make a new life for herself and her son by living off an abandoned ranch in Arizona. The only problem is that she hasn't the faintest idea on how to live off the land. The other main character is O'Reily, an Enforcer for the new government who becomes disillusioned by the brutality of the job and decides to run away. He stumbles across Maggie and insinuates himself with the pair. Initially, Maggie is distrustful of O'Reily but that mistrust eventually wears away over time, and friendship blossoms. For a post-apocalyptic story I rather enjoyed reading this one. It didn't focus heavily on the whole end of the world situation which was refreshingly nice. Sometimes these types of books can invest too much time on the how's and the why's, which is perfectly fine if you're into that but I prefer reading about the story and the characters that have to live their lives in such worlds. And to be honest you could read this book and forget that mankind is on the brink of extinction. One of the strong points in this novel was the character development. Both, Maggie and O'Reily were well developed and you can see a palpable change in their personality over the course of the book. Their characters were easy to relate to and cheer for. The writing was good and the plot flowed along nicely. I didn't spot any typos but then again I wasn't look too hard for them. One minor point of criticism I had was that the story suffered with a bit too much description. I understand that the author wanted to paint a vivid picture of the setting and that picture was certainly painted but I did find myself disinterested reading about every brook or rock in the story. An enjoyable read and I'll definitely be keeping an eye out for the sequel. If you're looking for an after-the-end type book, but one that focuses more on the characters and their struggle to survive then I highly recommend this one. However, if you're looking for something more hard-core then you won't find it here.